Listings for ITV 1 HD on Thursday, November 6 2014 (This week's UK TV & radio). 08:30	Lorraine Morning show with a topical mix of entertainment, discussion and showbiz glamour. 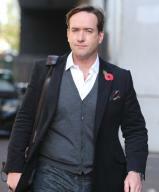 Matthew MacFadyen and Jerome Flynn join Lorraine to chat about period crime drama Ripper Street. Vingt photographies de l'événement disponibles chez Rex Features. Quinze autres photos chez WENN et revendeurs, dont Newscom.